"We were downsizing to a Bungalow and had lots of things that we needed to get rid off.. The staff at Diamond Waste Services were brilliant from the initial phone call to the job being finished. Nothing was too much trouble, they sorted everything out and even cleared the attic for us and were really friendly and courteous. We can’t thank them enough as they made something that was so stressful so much easier. We would recommend them to everyone." "I have used the Diamond Waste Services teams in London on many occasions and will continue to do so. The service they provide is always effective and well priced. Their response time is excellent and the out of hours service has been invaluable to me." "We had a new bathroom fitted and used Diamond Waste Services to get rid of all the rubbish, they were so much faster and cheaper than a skip and a lot less hassle and they did a great job. We will definitely be using them again when we sort our garden out in the summer." 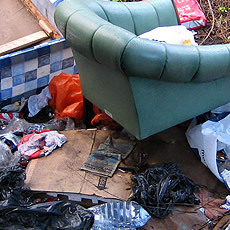 "I contacted Diamond Waste Services to clear my mum’s property in central london after she had passed away they were a massive help and made a very hard job an awful lot easier. The team were extremely thoughtful and took the time to ensure that the job was done in a courteous and professional manner." "Thanks for the rubbish clearance today, your 2 men were fantastic and just kept going until the truck was full. They were so nice and helpful I will definitely book them for my next loads when I'm ready"
"We were very happy with the waste collection. 10 out of 10"